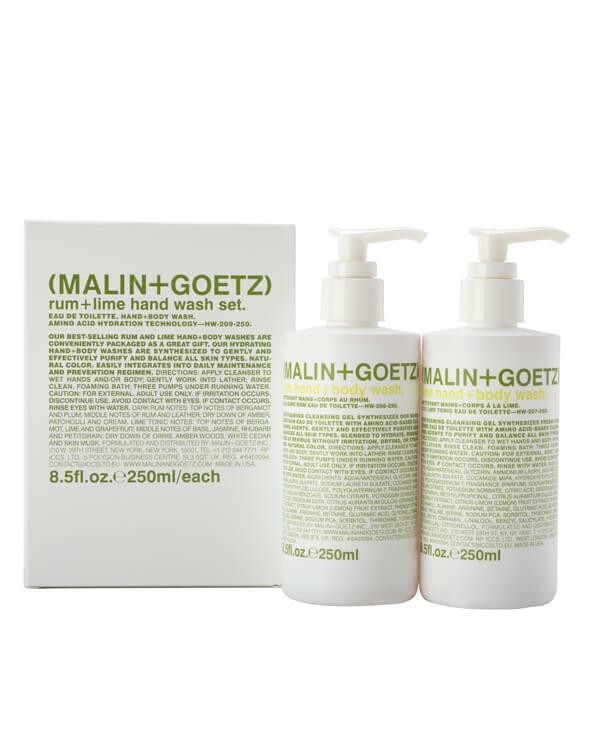 The popular Rum and Lime Hand + Body Washes from (Malin+Goetz) are beautifully packaged in this colorful box, and makes a wonderful gift for any occasion! The Lime and the Rum Hand + Body Washes are effective, hydrating hand washes fragranced with respectively the (Malin+Goetz) Lime and Rum Tonic eau de toilette. The foaming cleansing gels synthesize the eau de toilette with amino acid-based cleansing agents. Gently and effectively purify and balance all skin types, unlike traditionally harsh detergents. Blended to hydrate, rinsing free of residue without irritation, drying, or stripping; Reduces epidermal stress associated with hand washing. Natural color. Easily integrated into daily maintenance and prevention regimen. Apply the Rum or Lime Hand + Body Washes to wet hands, gently work into lather; rinse clean. The Hand Washes are so gentle, that they maybe be used as a scented shower gel or foaming bubble bath with three pumps (or as desired) under running water. This modern and stylish apothecary brand from New York stands for simplicity. Based on the philosophy that cleaning and moisturizing are sufficient enough for perfect basic skin- and hair care, Malin+Goetz products offer a two-step regime for perfect head-to-toe PH balance. Having started with products for sensitive skin, the brand now has a complete skincare range for face, body and hair. Each advanced formula blends trusted natural ingredients with tried-and-tested performance technologies to deliver the most effective treatments without sacrificing on luxury. Malin+Goetz’ products are tailored to the needs of women and men with a modern lifestyle!